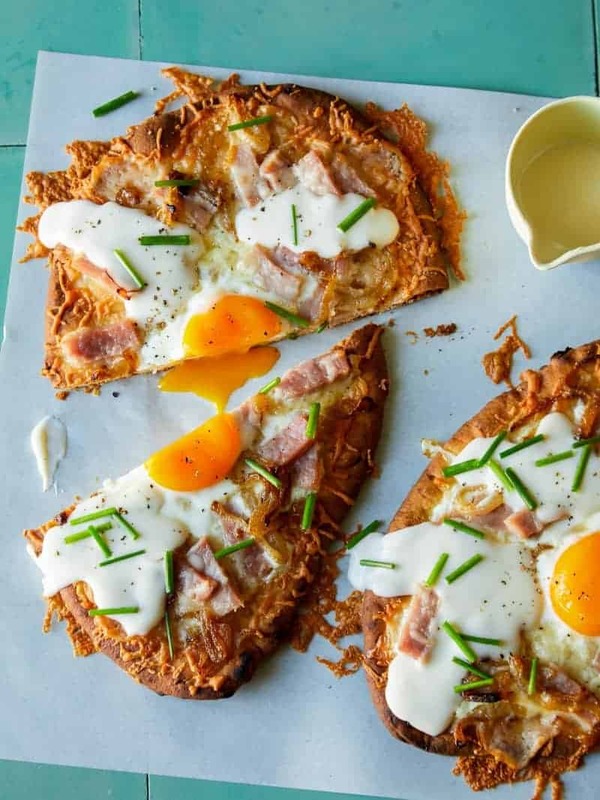 We’re heading into the weekend with these tasty little Croque Madame Flatbreads! I love how unapologetically indulgent croque madames are (like knife and fork required kind of unapologetic) Seriously. It’s not something you can really eat everyday, or all that often, but when you do eat one, it never fails to hit the spot, amirite? Our flatbread version is simple, delicious and because we’re not sandwiches two pieces of bread together, I’m counting this as low-carb, okay? haha. This is definitely a weekend sort of meal, but great at anytime whether for breakfast, lunch, dinner, or “4th meal” (it’s cool, we’ve all been there). 2. Lightly toast flatbread directly on the center rack of the oven (you want to barely toast the bread, so that it just begins to stiffen, but not actually brown). 3. Mornay sauce: Melt butter in a small saucepan over medium heat. Add flour and stir over heat for 2 to 3 minutes to cook off any raw flour taste. Add milk in a steady stream while whisking, then continue to cook and whisk until mixture thickens enough to coat the back of a spoon. Remove from heat and whisk in dry mustard, ginger, gruyere, and Parmesan. Continue to stir until cheeses melt and sauce is smooth, 3 to 4 minutes. Season to taste with salt and pepper. Set aside. 4. Remove flatbread from oven, transfer to a baking sheet and top each with a thin layer of mustard, followed by a sprinkle of gruyere cheese and ham. 5. 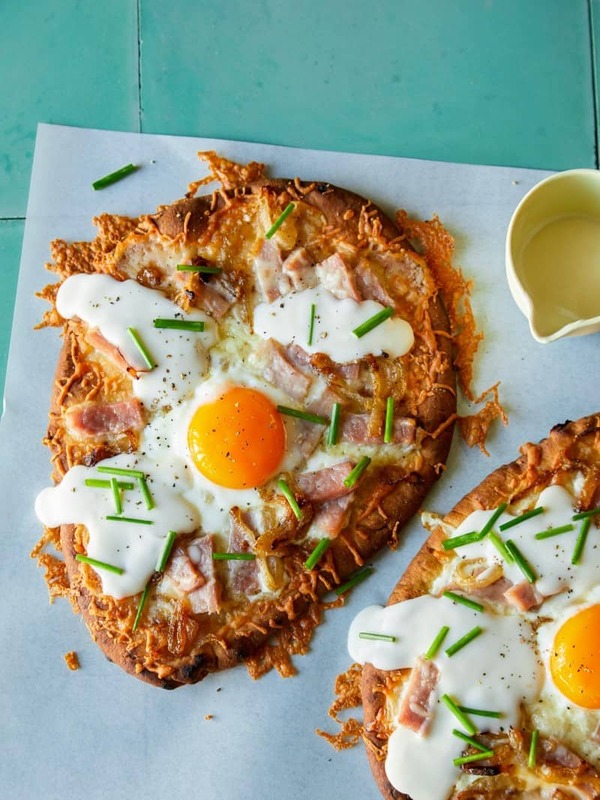 Create a divot in the center of each flatbread and fill each with an egg white. 6. Transfer to an oven and bake for 10 to 12 minutes or until cheese has melted and egg whites are mostly set. 7. Remove flatbreads from oven and top each egg white with a yolk and replace back in oven for an additional 3 to 5 minutes or until egg whites fully set, but yolks are still runny. 8. Drizzle each flatbread with mornay sauce, season with cracked black pepper and finish with sliced chives. Serve immediately. **Tip: If mornay sauce cools and thickens too much while flatbreads are in the oven, place back over low heat and stir in warm water or milk, 1 tablespoon at a time, until sauce thins out to drizzling consistency. Adjust seasoning, if needed, and serve.